Image page title is a text that appears on the image page above the full-size image. By default most of the built-in templates use gallery title for the image page title. But you can easily change it on the Options step, the Image pages tab. In the Page title section there are several boxes you can use to change the image page title. If more than one box is checked at the same time, then image page title will have more than one line of text. If you check the Gallery title box then image page title will start with the gallery title which you can change on the Gallery step. 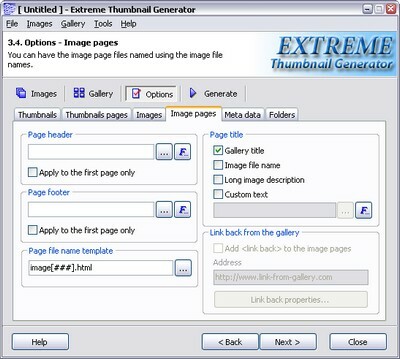 If you check the Image file name box then the file name of the image will be added to the page title. If the Long image description box is checked then the long image description which you can enter on Images step is added to the image page title. If you need any other text to be added to the image page title then check the Custom text box and enter the desired text. You can enter any HTML tags is the custom text field. Also you can add any EXIF or image file information to the custom text. Simply click the ... button next to the Custom text edit field and then, in the multi-line text editor, click the button to select any special tag.